New observations suggest that a pulsar embedded deep within the Jellyfish Nebula may have formed at the same time; both remnants of an ancient supernova blast. An explosion in space may have created not only a brilliant nebula but also a rapidly spinning neutron star, according to new data from NASA's Chandra X-ray Observatory. 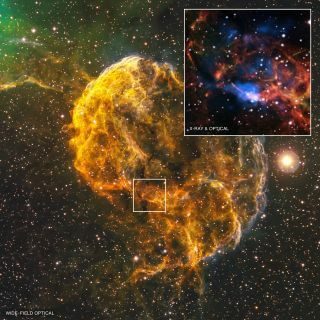 Observations of the Jellyfish Nebula, the remnant of a supernova 5,000 light-years from Earth, show an unusual object located on the southern edge of the nebula. Scientists have named the object CXOU J061705.3+222127, or J0617 for short, and they believe it is a stellar powerhouse known as a pulsar. In the new view from Chandra, a ring surrounds the suspected pulsar, and a jetlike structure passes through it. Scientists think the ring indicates either a region in the nebula where a high-speed wind of particles flowing away from the pulsar abruptly slows down, or a shock wave, similar to a sonic boom, ahead of the pulsar wind. Similarly, the jet could be particles fired away from the pulsar in a narrow beam at high speed. The amount of X-ray radiation around the object provides further evidence that it is, in fact, a pulsar. NASA officials said the amount of X-ray radiation at different wavelengths, as well as the way the radiation spreads out surrounding the object, matches the patterns for known pulsars. Some doubt exists, however, about whether the pulsar is really connected to the Jellyfish Nebula or whether it's just an unrelated neighbor. The pulsar's cometlike tail of X-ray emissions is aimed about 50 degrees away from what would be expected from a pulsar moving away from the center of a supernova remnant in a straight line. However, scientists say it could be explained by movement of material in the nebula that could change the direction of the cometary tail. Researchers remain uncertain about the Jellyfish Nebula's true age. While this research would suggest it's around 30,000 years old, other scientists have guessed its age to be only 3,000 years.